In an effort to try and energize my evening, I ended up finding some new music to listen to. Some is good, some isn't, but Mumford & Sons is a definite highlight of the batch... too bad I just missed them in concert a few weeks ago. The new Foals album is so-so from a first listen, which is unfortunate considering my enthusiasm for its release. Can't win them all I suppose. Tonight consisted of staring at music blogs and watching part of The Pick of Destiny-- this helped to quell the dullness. I didn't work out today to try and avoid further leg injury... I fear those 5-6 minute miles at the end of my runs might begin to take their toll. Tomorrow morning I'm throwing caution to the wind and hitting up the gym extreme-like. If the endorphins don't get me out of this stupor I don't know what will. Nothing is happening over here. I've been back from SLC for all of a week and I'm starting to get bored out of my mind. Tomorrow's a new day to head out on a quest for laughs and adventure. Life's too short to sit and wait. The 28th floor of my office building and a flash drive exchange are on my mind. If you know what I'm going on about, this is a call to arms. 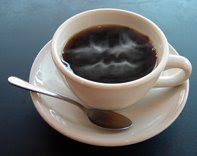 A steaming cup of cynicism.